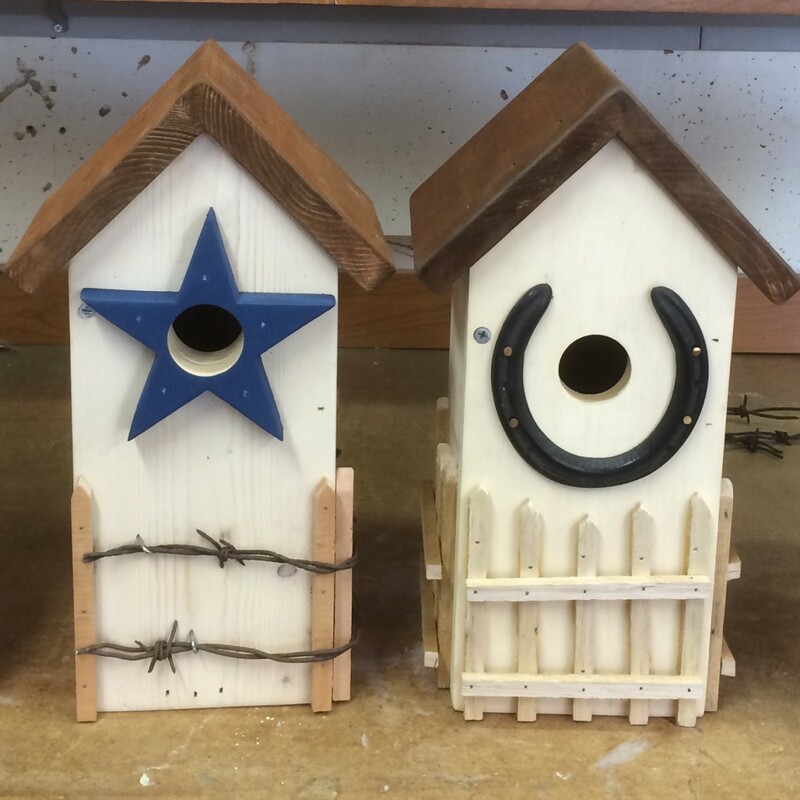 Suet feeders attract a variety of birds including woodpeckers, nuthatches, bluebirds, cardinals, chickadees and wrens. A popular choice for feeding birds during the fall and winter, suet offers a convenient and nutritious source of fats and protein when the birds need the extra calories and energy to survive the cold weather. 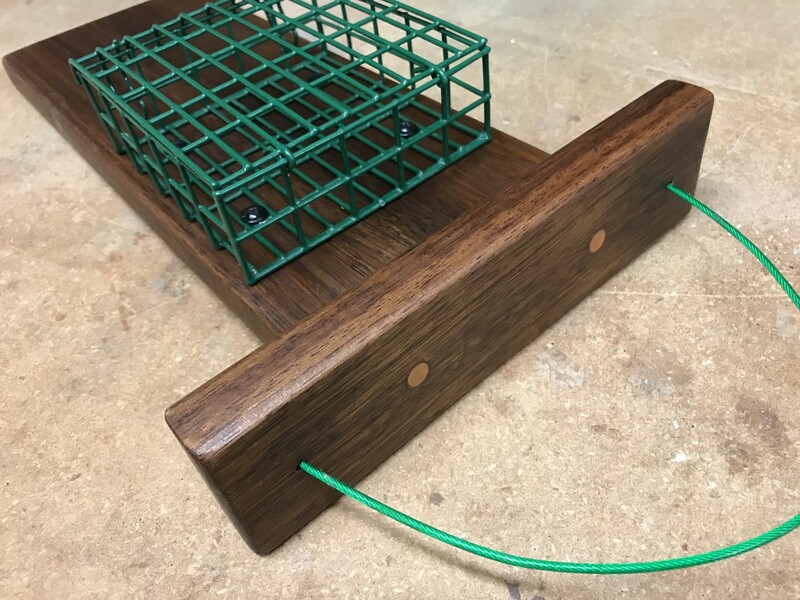 Our simple feeder design uses the same basic wire cage that's used to hold prepackaged suet cakes and then makes it easier for woodpeckers and flickers to feed comfortably by adding a tail prop. These birds use their stiff tail feathers to balance as they cling to the feeder. Extending the base of the feeder plank below the suet cage gives the birds a place to rest on their tails for extra support. And the top plate above the suet cage offers a perch for other feathered visitors including bluebirds and chickadees. It also helps to protect the suet cakes from the sun and rain. 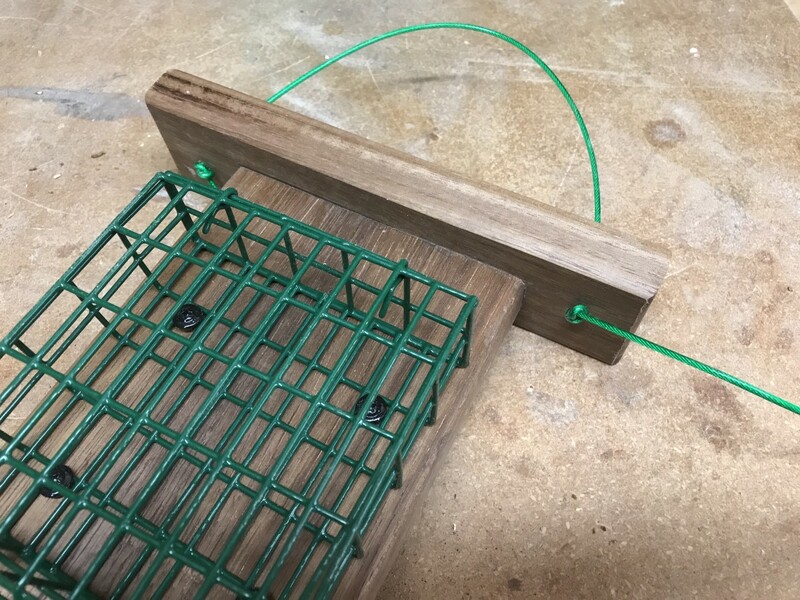 The prop feeder starts with an inexpensive wire suet cage. I bought one for less than $3 from a local feed and grain store. Refilling the cage with fresh suet cakes is easy and takes just a few minutes. The top plate and prop tail sections were cut from pieces of mahogany that will weather nicely over time, though you can use any other available wood such as cedar or pine. 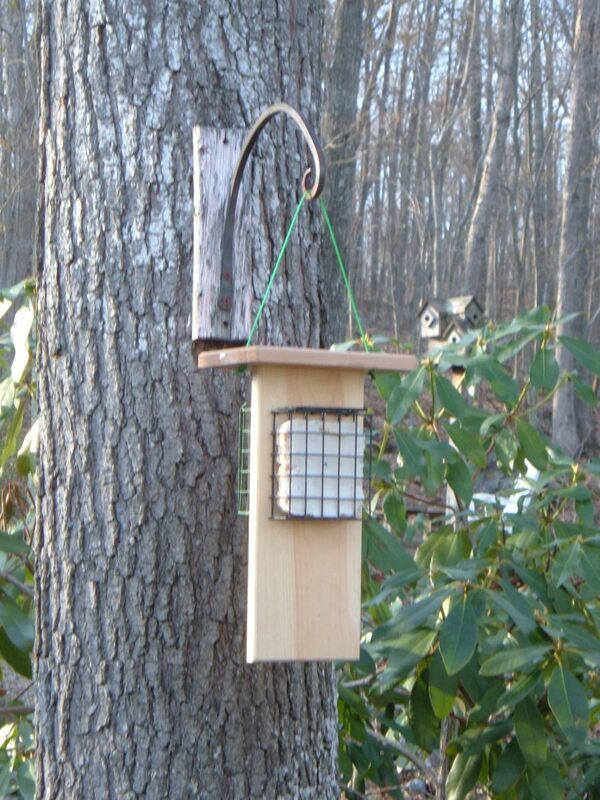 The short cable attached to the top plate makes it easy to hang the feeder from a branch or decorative bracket. 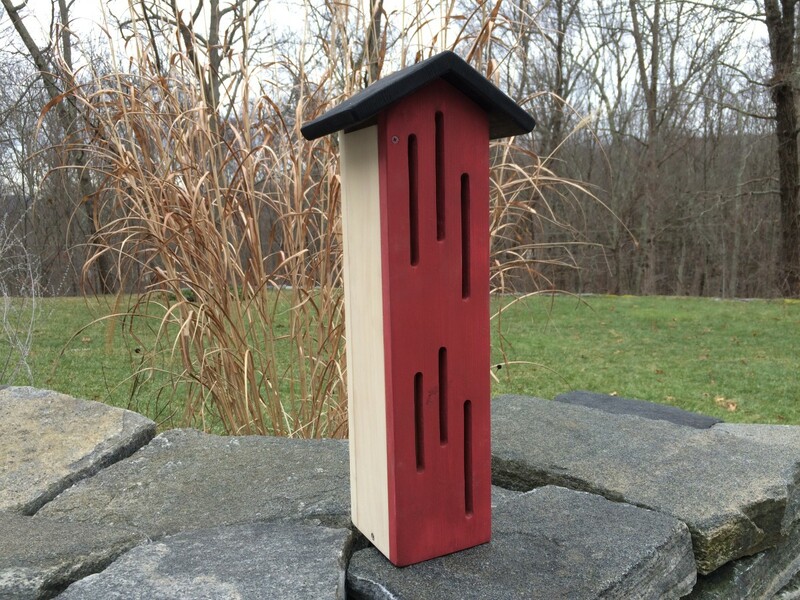 The rough texture of the boards let the birds holdfast to the feeder. I've seen prop feeders made of plastic, though the surface seems to smooth for the birds to grasp firmly. 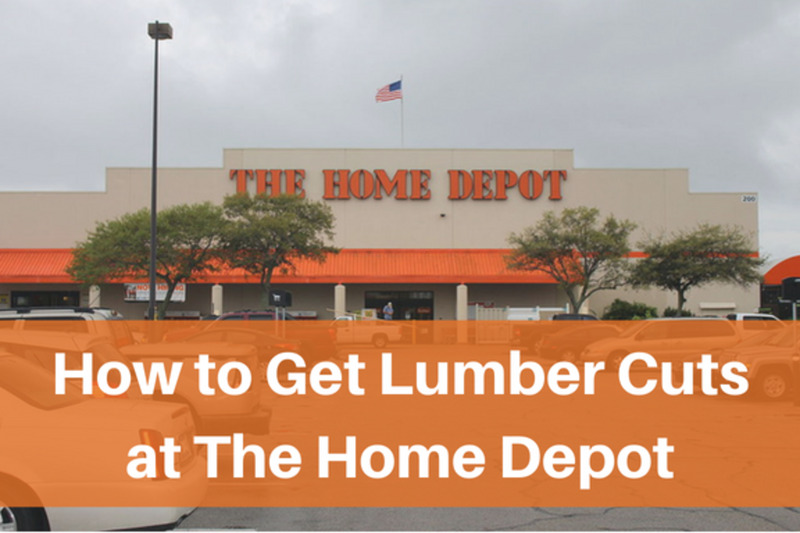 To make the feeder plank for the suet feeder, cut two pieces wood into the following dimensions. The exact dimensions are not critical, however the prop plank should be at least 12" long. I used leftover scraps of mahogany that were salvaged from a neighbor's deck project. After cutting the pieces to size, I used a router with a 3/8" round-over bit to mill a decorative edge along the top plate. Using the same bit, I routed edges down both sides of the prop plank and along the bottom edge. Do not mill the top edge of the feeder plank where it will attach to the top plate. The top plate is attached to the prop plank with a couple of weather-resistant screws. I centered the top edge of the prop plank onto the underside of top plate, and then traced around it to mark its location. 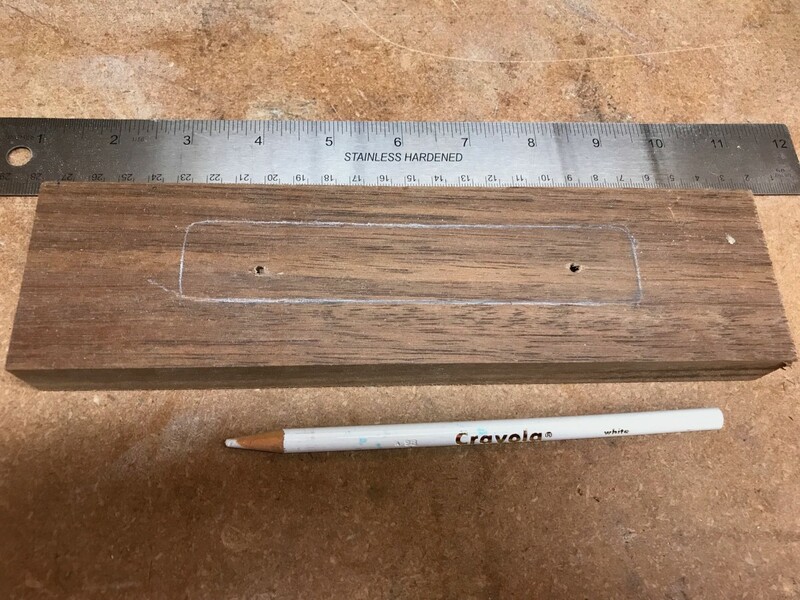 A white colored pencil makes it easier to see the pencil marks on the dark wood. I drilled and countersunk two holes within the outlined area. 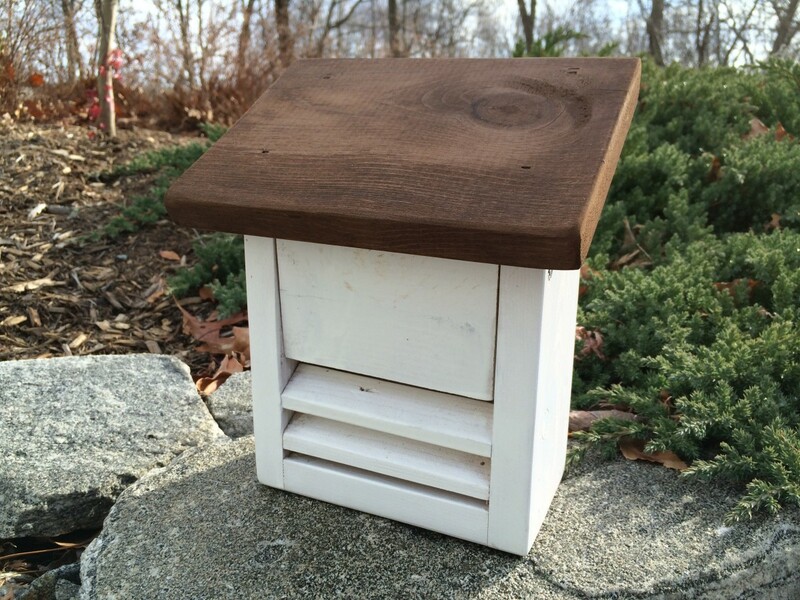 The top plate is attached to the top edge of the feeder plank using a dab of waterproof glue and two weather-resistant screws. Drill two more 3/16" diameter holes approximately 1" in from each end of the top plate. I threaded a short piece of cable through these holes for hanging the feeder. An overhand knot hold the cable securely in place. Attaching the top plate to the tail prop section with screws left two countersunk holes. To help protect the screws from the weather (and for a finished look), I cut two wooden plugs from a scrap piece of mahogany using a plug cutter. This simple device attaches to a drill press and cuts neat little circular plugs that fit perfectly into the countersunk holes. A bit of glue holds them in place, then I sanded the plugs smooth to the surface of the top plate. The photo shows the finished top plate after sanding, two coats of mineral oil and a good coat of wax. 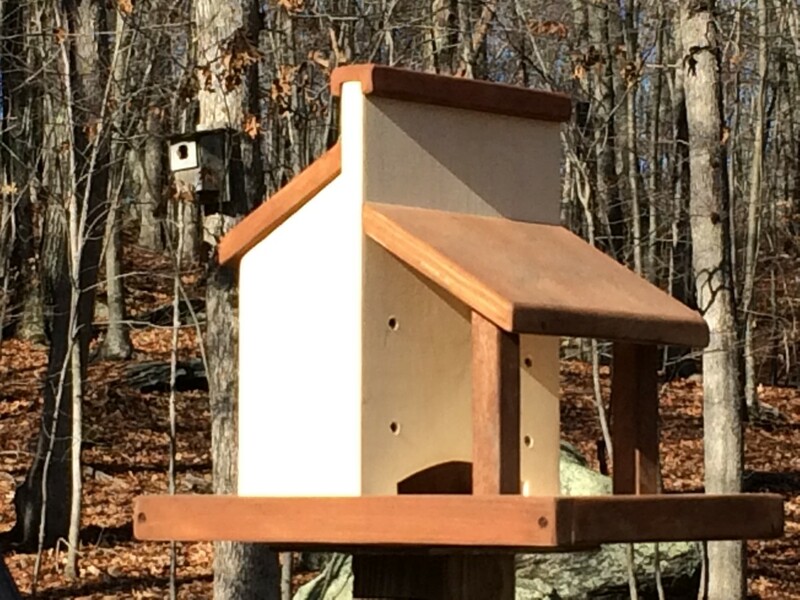 The suet cage is attached to the prop plank with a few carefully placed pan-head screws. Small screws with over-sized washers would also work. I sprayed the screws with outdoor paint to resist rusting. Position the wire cage on the prop plank, centered across the width of the board while leaving enough space at the top to open the cage for filling with suet cakes. 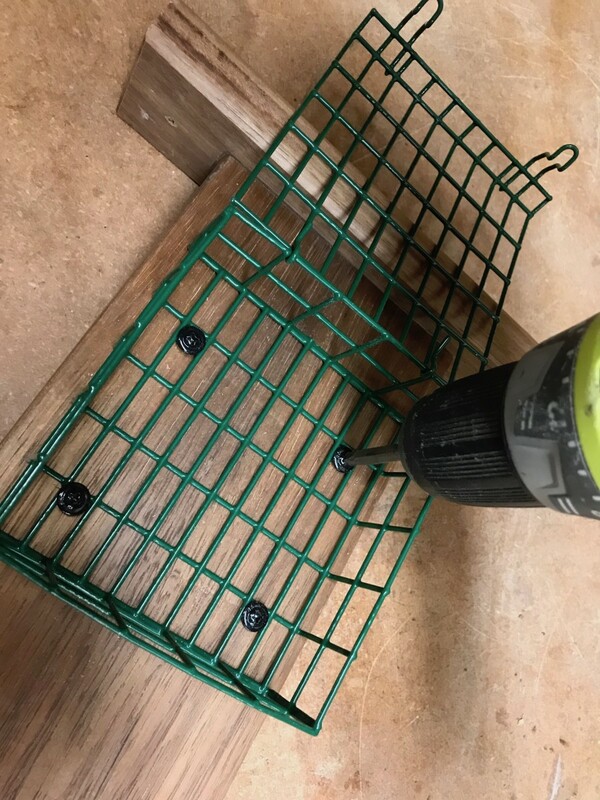 Use the short screws to secure the suet cage to the feed plank. The screws are placed strategically in the corners of the wire mesh to hold the suet cage in place without moving around. I used an 18" length of 3/16" diameter plastic coated cable to hang the feeder. The bright green cable is available from the big box home improvement stores for less than $.40 per foot and it holds up well to the weather. Thread the ends of the cable through both holes in the top plate. 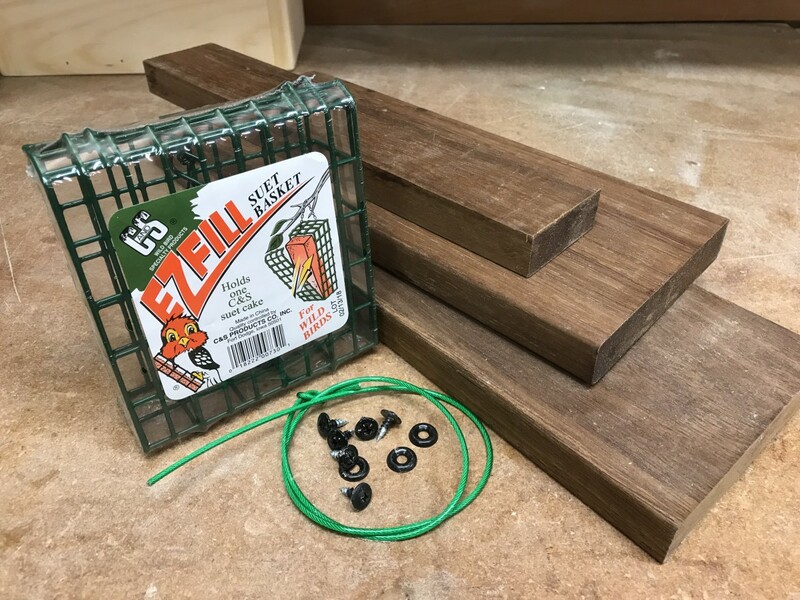 Tie each end with a simple overhand knot, and the suet feeder is ready for the birds. 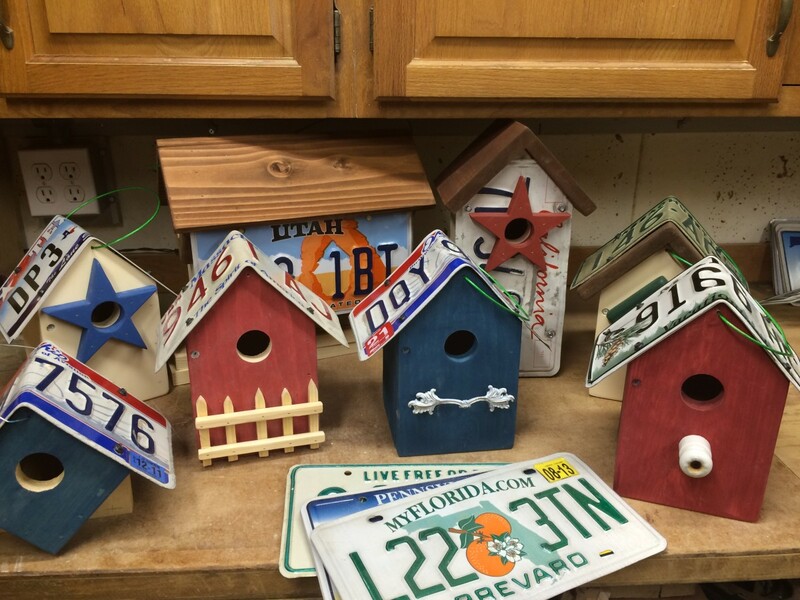 Our suet feeder hangs from a decorative bracket that's attached to a tree and about 6-1/2 feet above the ground. The height keeps the suet away from dogs and coyotes, yet is low enough for me to reach for refilling. The woodpeckers often land on the tree, circling around it until they are comfortable enough to flitter over to the feeder. 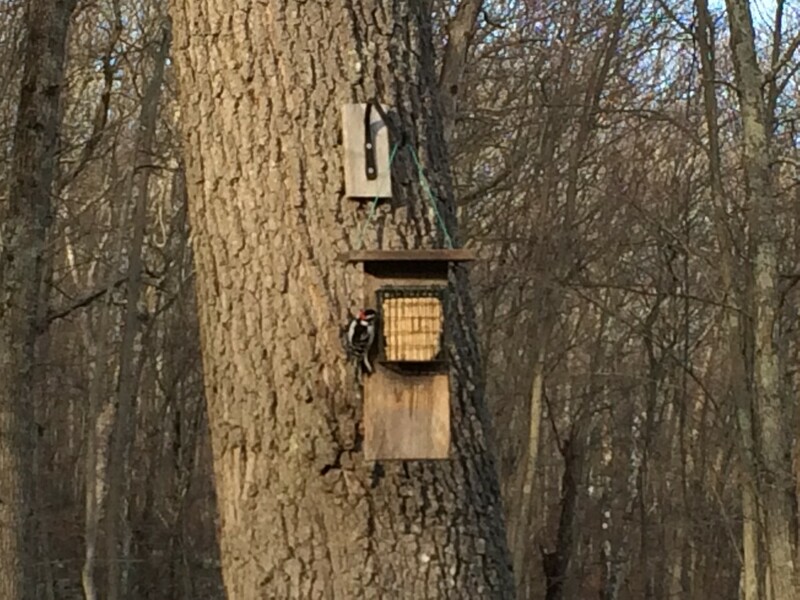 It's not uncommon for several birds to congregate on the tree and around the feeder while vying for a meal. Commercially prepared suet cakes are cheap, convenient and offered in a variety of flavors that often include peanuts and bits of dried fruit. We usually buy variety packs of suet cakes by the case (10 suet cakes for about $10). Making homemade suet cakes is a fun and easy project, and you can adjust the ingredients to attract specific types of birds. Suet or beef fat trimmings are readily available from your local butcher including the meat counters of the large grocery chains. Adding peanut butter, black oil sunflower seeds, millet, bits of unsalted nuts or dried fruit such as raisins and dried cranberries create a flavorful suet cake that the birds will love! In a small pot over low, melt the suet and peanut butter until they are liquid and smooth. Stir frequently. Add the corn meal and stir until smooth. In a separate bowl, mix together the seeds, millet, nuts and dried fruit. Pour the melted suet and peanut butter mixture over the seeds and mix well. Spoon the mixture into molds. We save the plastic containers from store bought suet cakes. Reusing empty soft butter containers also works well. Refrigerate the filled molds to cool. Two Cakes Are Better Than One! Adding a second suet cage to the other side of the prop plank doubles the amount suet cakes for the birds. 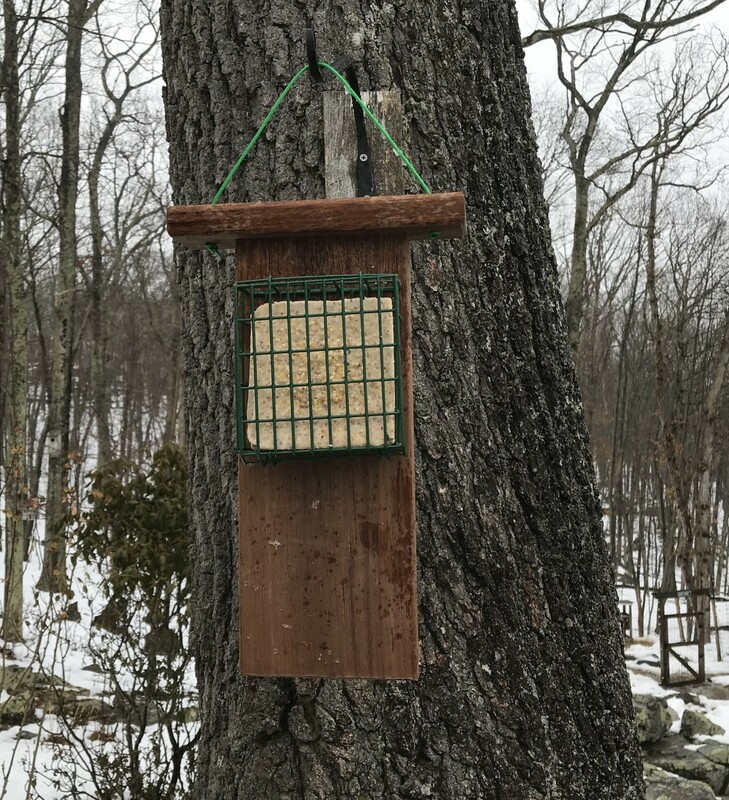 We usually put out different flavors of suet in each of the cages to give the birds a choice and to increase the chances of attracting more varieties of birds. 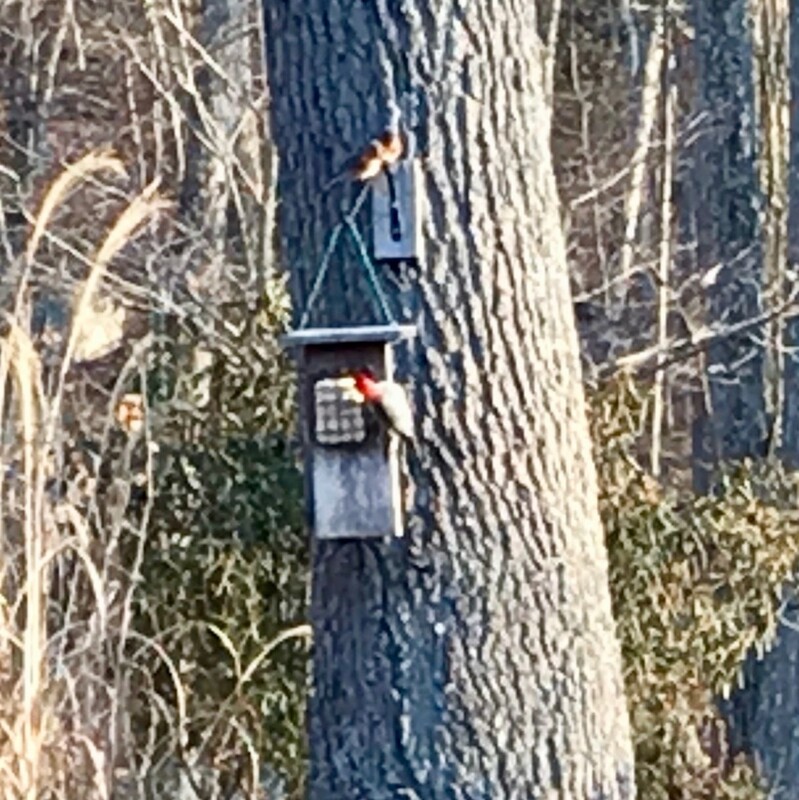 Tell us about the birds that visit your suet feeders. Reading this reminded me of the suet cakes that my parents used to hang in trees during the cold Wisconsin winters for the birds. You certainly attract a good many birds to your suet feeder! 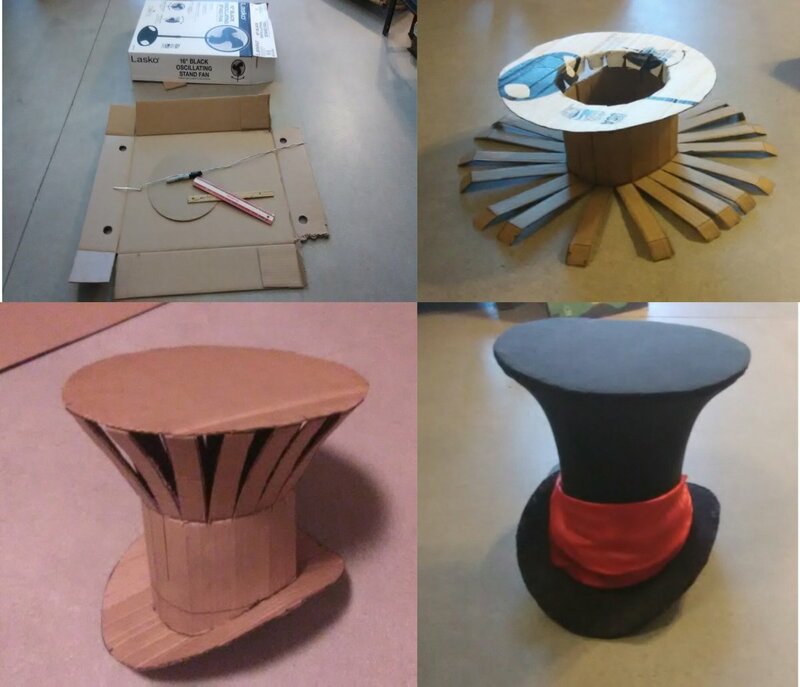 The pictures make this an easy to follow how to. 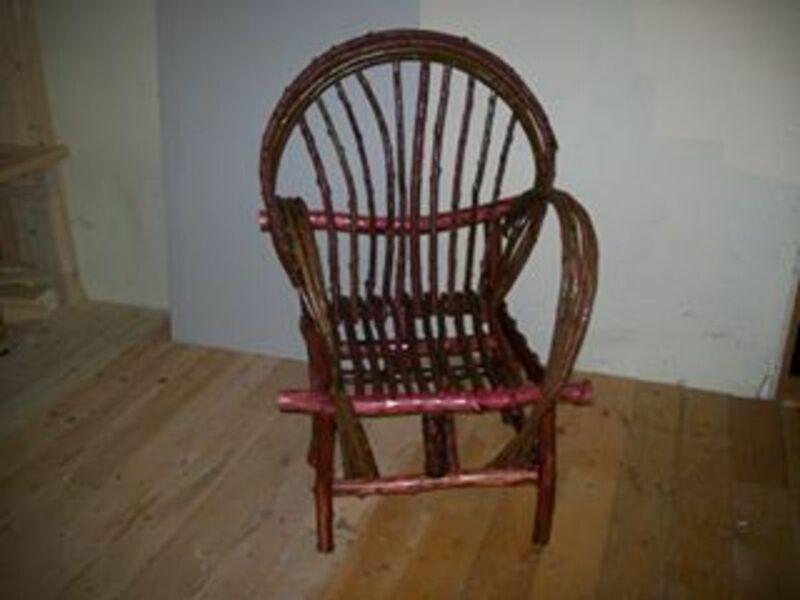 This is a perfect project in the cottage. Very cool! I may have to try this! Thank you for sharing!